Think of a typical Victorian Anglican church. St Mary’s ticks all the boxes. It has about 30 pre-school kids with their SUV buggies parked around the entrance; a priest, Marjorie Brown (I swear one parishioner said ‘Marge will see you in a minute’); a woman in the sacristy on her knees polishing the brass bits of what might be banner poles; smiling faces offering me tea or coffee three times in as many minutes. But St Mary’s has one rather jagged, irregular character that other churches don’t: Jason Allen. The centre works with more than one hundred different young people, which produces two hundred interactions a week. They come from Swiss Cottage, Chalk Farm, Gospel Oak, Primrose Hill, King’s Cross and Camden. It might seem that St Mary’s is ideally situated at the centre of this network. But it’s not as simple as that. Because of gang territories, a young person cannot walk from, say, Morrisons straight up Adelaide Road to St Mary’s. St Mary’s does not get any funding from Camden Social Services or the police. Such funding comes with strings attached and Jason needs to be able to negotiate with each young person as an individual with individual needs. Their seedcorn funding comes from John Lyons Charity and Tancroft. They rely on donations and a team of volunteers. Some of these have been in prison and have come back to St Mary’s to pay back for the help they have been given. Without them the project could not work. They help with mentoring, residential courses, getting young people back into education, and also with jobs, football games, health and fitness, music and media and much more. All very commendable, but how did Jason the 28-year-old community leader with a partner and young daughter become the person he is? He grew up in King’s Cross in a single-parent family with an older sister and a younger brother. By sixteen his mother could not manage and Jason went to live in an adult hostel in Willesden. He continued to go to school but left with only English and Maths qualifications, gained at the third try. Fortuitous? Maybe. The leader persuaded Jason to go on a two-week volunteering visit to Bangladesh. Jason didn’t realise it at the time, but he had been targeted as ‘at risk’. This was not a life-changing moment. Jason had changed in many ways, but he still had to come back to live in the hostel, without work, among the gangs. 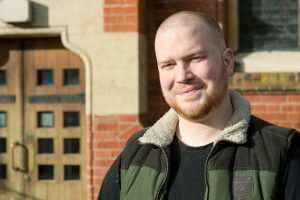 The change really happened when the youth club offered Jason a six-month placement, paid employment funded by the Rank Organisation with distance learning as part of the package. In the time Jason was at the youth club, the numbers sky-rocketed. The young people loved him. He was a natural. Then he was asked to apply for the post of youth leader at St Mary’s. And now Jason has been at St Mary’s for eight years and next year completes his distance learning degree with Canterbury University. The ex gang member has come a long way.